I was on duty below in the engine room when General Quarters was called around 02:00. I went immediately to my battle station on the starboard side at a 40mm gun. It was a very dark night. After a short while, we were ordered back to our normal duty stations. 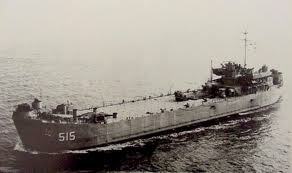 Our ship was at the very front of the convoy of 8 LSTs. Later, the General Quarters alarm was sounded once again, and I went back to my battle station. Suddenly there were flares in the air and I saw the E-boats speeding around our convoy. A remnant of one of the flares landed on my right shoulder. I opened fire on the E-boats and there were red and green tracers everywhere. It was difficult to take aim at the E-boats because they were so fast. Those in the engine room heard torpedoes scrape the bottom and hit the hull of our ship, but they did not explode. I saw LST 531, which was in the middle of the convoy, at a distance in flames. LST 507 was at the very end of the convoy, and it too was on fire. The E-boats left and our captain, John Doyle, followed orders and began to leave the area. However, he then decided to disobey orders and went back to rescue survivors. Later he said he went back because he could not bear the thought of all those men dying in the frigid waters. Cargo nets were thrown over the side of our ship and I climbed down to help pull men out of the water. A fellow crewman, John Provini, was at the top of the cargo net, throwing a rope out at regular intervals to tie around the men I was grabbing to help pull them up onto the deck. Some of the men were trying to swim to us, but couldn’t get close enough. I went into the water at times to help them. Other crewmen swam out to the survivors and pulled them in closer so crew members could reach them. We stayed there until daylight, when a British destroyer arrived to continue the rescue of survivors and retrieve bodies.LST 289 was hit, but did not sink. They lost 13 men. Another LST in the convoy attached their ship to LST 289 and towed it back to port. Once we got back to port, we began to unload the men who survived. We were ordered not to speak of the tragedy so the Germans would not discover our plans for the invasion.